Hull worried about his supply line from Ohio. He was also convinced he was outnumbered by fierce, unrelenting warriors. Anxious to keep “his friendly Indians” in Michigan Territory neutral he called for an all native conference to renew their pledges of neutrality. Captain Lewis, Logan and The Wolf acted as scouts for Hull when he hacked his way through the bogs of northwestern Ohio and dense forests of Michigan to Detroit. Black Hoof joined them just after their arrival. Hull assigned them the task of calling the friendly chiefs to a council at Walk-In-The-Water’s Wyandotte village near Brownstown. Tecumseh, Roundhead and Main Poc were invited but declined. On July 15th Black Hoof spoke to the council of nine nations. Chiefs from the Ojibwa, Ottawa, Potawatomi, Wyandotte, Kickapoo, Delaware, Munsee, Sac and Six Nations of the Grand attended. He brought them a message from the great American war chief who was at Detroit explaining that the Americans were obliged to go to War with Great Britianir because they would not permit the them to enjoy their neutral rights. Further, it was not of interest to the First Nations to concern themselves with the two government’s differences. And because the British were too weak to contend with them they were enticing all the nations around to join them in their fight. It was the desire of their Great Father in Washington that they not do so but remain neutral and enjoy their peace. Lewis and Logan followed with reminders of how the British treated them at the end of the War of Independence and how they were abandoned at Fallen Timbers. They argued that they all should let the Red Coats and the Big Knives fight their own battles and if they did they could be assured their Great Father in Washington wanted no more of their land and he would always care for needs. The chiefs still believing the British were fighting an unwinnable war professed their continued neutrality and July 20th the conference ended. Black Hoof, Logan, Lewis and The Wolf left immediately for Piqua and the Conference called for on August 1st. A week later Major James Denny moved down the Canadian shore of the Detroit to just short of the Aux Canard. He was at the head of 120 Ohio Militiamen when they came upon a small party of warriors who were out of range. They traded shots to no avail while the warriors sent for reinforcements. Denny also sent one of his men back up the road to Sandwich and their main camp. Unfortunately, he ran into another small war party of thirteen at Turkey Creek where he was tomahawked. He would be the first American soldier killed in the war. Tecumseh and Main Poc rushed from Malden with 150 Shawnee, Ottawa and Potawatomi warriors. They skirted the road to a tall grass prairie called Petite Cote just beyond the bridge and set up an ambush. The small war party who killed the militiaman at Turkey Creek appeared and twenty militiamen gave chase down the road and past the ambush. The main body of warriors emerged from the tall sunflowers and wild carrots amid screeching war hoops and gunfire directed at Denny. He saw that he had a disaster on his hands. His troops were scattered so he broke with the main body for a wood lot on his left to set up a defensive line. The line held but the warriors moved to take possession of the road to his right. When they saw their only escape route was about to be cut off and they would be surrounded they panicked. They rushed for the road, every man for himself, with the warriors hot on their flank. They managed to reach the road safely but were in full retreat, running pell-mell back to Sandwich. The warriors hounded them all the way stopping along fence lines, orchards and behind homesteads to take pot shots at the fleeing Americans. They finally broke off the chase at Turkey Creek. Denny lost five killed, two wounded and one taken prisoner. The warriors lost one killed and three wounded. The American captive was treated very badly because one of his comrades, William McColloch, found time during the skirmish to scalp the dead warrior. He was bound and whipped with ramrods but he did live and was ransomed by British Indian Agent Matthew Elliott. The warriors now shifted their efforts to the other side of the Detroit. On August 3rd Tecumseh, Roundhead and Captain Adam Muir led a large force of warriors along with 100 Red Coats across the Detroit to Brownstown. They surrounded the towns of Maguaga and Brownstown and rounded up the inhabitants. Maguaga, Blue Jacket’s town, was inhabited by a mix of Shawnee and Wyandotte while Walk-In-The-Water’s town were all Wyandotte. The total population was approximately 300 all remaining neutral in the war. The whole population was spirited back across the boarder to Bois Blanc Island where a council was held. Tecumseh and Roundhead pleaded for the Confederacy’s cause. Miere or Walk-In-The-Water retorted with his intention of keeping his word to remain neutral. In the end Tecumseh won out convincing the neutral First Nations to capitulate and join his cause. This added about eighty warriors to his force. Two days later Tecumseh left Amherstburg again. This time he crossed the river with a much smaller force of just twenty-five. Their scouts made them aware of a mail run making its way north from Frenchtown with communications from Ohio. They ambushed the unsuspecting column killing eighteen of the French volunteers and capturing the mail. Of the seven that made it back to Frenchtown two were wounded. Tecumseh’s scouts returned with more news. They had run across William McColloch, the same man that scalped the dead warrior at Petite Cote, who was with a scouting party of a mail run moving south. After learning that Major Thomas Van Horne was moving down the road from Detroit with 200 militiamen they killed all of the advance party including McColloch. Van Horne was intending to meet with the northbound mail to exchange communications. Tecumseh prepared an ambush at a most suitable spot and waited. Van Horne approached with his mail pouches protected in the center of his column. It was preceded and flanked first by infantry then mounted militiamen. As they passed the point of ambush the trap was sprung. Mounted men and officers fell first. The militia panicked and fled. Over the next two days they straggled into Fort Detroit in a state of shock. They had lost twenty-five killed and twelve wounded. Tecumseh lost one dead and two wounded but captured both north and southbound communications. One letter from Hull to Eustis pleading for reinforcements revealed his belief that there were 2,000 unrepentant warriors about to descend on Detroit from the north country. A most valuable piece of information indeed. Hull was fraught with anxiety. His most vulnerable asset was now breached. His supplies were cut off. He failed to take the bridge on the Aux Canard or Fort Malden. He seemed to see Tecumseh’s warriors everywhere. He withdrew his small advance stationed at Sandwich back to the fort and he sent a dispatch to Fort Dearborn to abandon their post and retreat either to Fort Wayne, Detroit or Michilimackinac. Now Hull gave up any notion of advancing and he assumed a defensive position inside the fort. The American invasion was over! Tecumseh arrived back at Prophetstown in late January 1812 but there was no warm welcome awaiting him. To his bitter amazement the Shawnee town at the junction of the Tippecanoe and Wabash Rivers lay in ruins. When told the details of the disaster he was furious. He had left specific orders with his brother not to engage the Big Knives but to appease them at all cost. He had told Tenskwatawa, the Prophet, that time would come, but not now. It was too early. It is reported that he was so enraged that he grabbed his brother by the hair, shook him and threatened to kill him. The summer of 1811 was one of fear and apprehension all along the frontier. The summer of unrest was caused by a few young warriors loyal to Prophetstown but nevertheless hotheads acting on their own. They had been raiding settlers farms, stealing their horses and a few had been killed. William Henry Harrison, the governor of Indiana, met with Tecumseh at Vincennes in July. Tecumseh tried to convince him that the confederacy he was building was not for war but for peace. He was not successful. They had met in council before and although they had respect for each other they disagreed strenuously. The year before their council almost ended violently. Winamek, a Potawatomi chief loyal to the Big Knives suggested the warriors at Vincennes raise a large war party and attack Prophetstown but Black Hoof convinced him otherwise. Black Hoof and The Wolf two Shawnee chiefs loyal to the Americans attended several councils with settlers in Ohio convincing them that they and their three hundred warriors were peaceful. Black Hoof took this opportunity to set all the blame for all the troubles at the foot of Tecumseh and Tenskwatawa. Meanwhile, in June some of Tecumseh’s entourage were busy recruiting followers from the Wyandotte of Sandusky. They encountered some resistance so they handled it by preying on the Wyandotte’s fear of witchcraft. They accused their opposition of it and three were burned alive as sorcerers including the old village chief Leather Lips. American officials called for conferences with their First Nation allies at Fort Wayne and Brownstown on the Detroit River. They came from eastern Michigan, Ohio and Indiana and all denounced the Shawnee brothers. The Shawnee delegation to Brownstown was led by George Bluejacket and Tachnedorus or Captain Logan the Mingo chief. Although the affirmed their loyalty to the Big Knives they took the opportunity to visit British Agents across the river at Amherstburg. Harrison was convinced that all the turmoil on the frontier emanated from Prophetstown. There was more trouble perpetrated by the young hot head warriors. Three of these warriors believed to be Potawatomi had stolen horses on the White and Wabash Rivers terrorizing the settlers there. While Tecumseh was on his three thousand mile sojourn building the confederacy Harrison began to assemble a large army at Vincennes. He was determined to disperse the First Nations who had congregated at Prophetstown. Harrison made his plans public telling Black Hoof to keep his Shawnee followers in Ohio so they would not be connected to the coming conflict. He also gave the same advice to the Miami and Eel River Wea but his words did not sit well with some of the Miami. Prophetstown was situated across the boundary in Miami territory and they did not appreciate having their sovereignty impinged upon. Word of the military buildup quickly traveled up the Wabash to Prophetstown. Tenskwatawa hurriedly call a council to decide what to do. The decision was made to send a Kickapoo delegation to Vincennes. Probably led by Pamawatam the war chief of the Illinois River Kickapoo the delegation was not successful. They had tried to negotiate that a settlement of the troubles with the settlers be sorted out in the spring. The news they returned with was not good. Harrison had assemble an army of one thousand soldiers and they were about to march up the Wabash. The only thing that would deter them was the return of stolen horses and for those who had committed murders along the frontier be handed over for punishment. Harrison also demanded the dispersal of Prophetstown. The Prophet had to decide whether to comply or fight. They were not in good shape for a major battle. The little lead and powder they had they needed to get them through the upcoming winter. They were outnumbered. The congregation at Prophetstown consisted of mostly Kickapoo and Winnebago warriors that had camped there to hear Tenskwatawa preach along with a sprinkling of Potawatomi, Ottawa, Ojibwa, Piankeshaw, Wyandotte and Iroquois. There were also a small number of Shawnee followers that lived there permanently. In total they could only muster four to five hundred warriors. Tecumseh was right. The time for a fight with the Big Knives had not yet arrived. Harrison started the long, lumbering 180 mile journey up the Wabash on the 29th of October. One third of the army he commanded were regulars from the 4th Regiment of the U.S. Infantry. The rest was made up by 400 Indiana Militia, 120 mounted Kentucky volunteers and 80 mounted Indiana riflemen. Harrison had hoped that his show of American military might would force Prophetstown to capitulate but he underestimated First Nations tenacity. The Prophet decided to disregard Tecumseh’s orders and stand and fight. Prophetstown scouts monitored Harrison’s progress up the eastern side of the Wabash while the warriors prepared spiritually for the upcoming battle. Tenskwatawa pronounce the Master of Life was with them and the spirits would assist in the battle by making them invisible. He prophesied that he had the power to turn the American’s powder to sand and their bullets to mud. When Harrison’s army arrived the warriors had worked themselves into a frenzy. The Americans made camp about a mile north of Prophetstown on a patch of high ground at Burnett’s Creek. They sent a delegation to give The Prophet one last chance to sue for peace but the three chiefs they met with refused the offer. Harrison planned to attack the next day. The Prophet and his council of war chiefs determined that being outnumbered 2 to 1 and low on ammunition the only real chance for success was to take the fight to Harrison that night. Before dawn about 4 a.m. on the 7th of November 1811 the warriors surrounded the American encampment. They could see the silhouettes of the sentries outlined by their campfires. Harrison and his officers were just being aroused for morning muster. The surprise attack began. The Winnebago led by Waweapakoosa would attack from one side while Mengoatowa and his Kickapoo would strike from the other. The warriors crept stealthily into position and just as they were about to commence the assault an American sentry saw movement in the underbrush that surrounded the encampment. He raised his rifle and fired and the battle was on! Blood curdling shrieks and war whoops filled the air accompanied by volleys of gunfire from the darkness all around. The warriors rushed forward and the American line buckled. Others scrambled to form battle lines. The volleys of musketry from the warriors was intense and some of the new recruits as well as the riflemen protecting the far left flank broke for the center. However, the main line of regulars held and the warriors were unable to break through. The right flank now came under a tremendous assault of gunfire from a grove nearby. Officer after officer, soldier after soldier was felled. The line was about to collapse when a company of mounted riflemen reinforced it. The warrior’s surprise attack was now in trouble. The American army was badly mauled but managed to hold. Ammunition was running low and daylight was breaking. The war party that had been so successful from the grove were now uprooted by a company of riflemen and were in retreat. Harrison turned from defense to offense routing the warriors who were out of ammunition. They began a full retreat back to an empty Prophetstown. When they arrived there with ammunition spent they decided to disperse. Harrison spent the rest of the 7th and some of the 8th of November waiting for the warriors to commence a second assault. When they didn’t he marched to Prophetstown only to find the towns inhabitants consisted of one wounded man and one old woman who had been left behind. They were taken prisoner but treated well. Harrison burned Prophetstown to the ground including the granary. It was going to be a long, hard winter. Harrison and his army limped back to Vincennes where he would claim a great victory. But his badly mauled forces told another story. American casualties amounted to 188 including 68 killed. First Nation estimates range from 25 to 40 killed. The warriors had given a good account of themselves having assailed a superior force on its chosen ground and inflicting higher casualties on them. 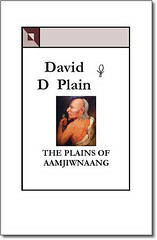 You are currently browsing the Books by David D Plain Blog blog archives for October, 2012.